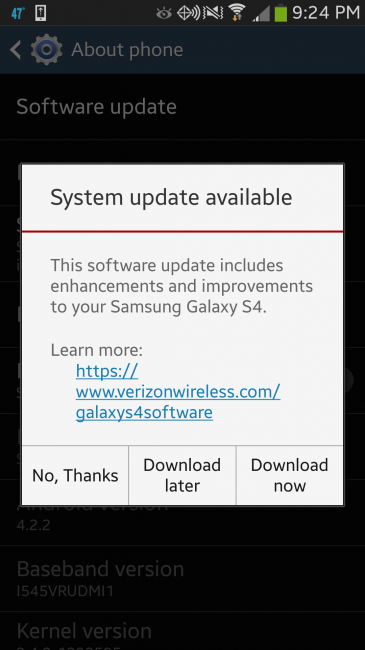 Verizon’s Galaxy S4 is now receiving Android 4.3 in a brand new update that went live moments ago. The update was approved this morning, bringing along Galaxy Gear Support, band 4 LTE, and some other tweaks along with the most current version of Android (for the time being) to Samsung’s 2013 flagship. We’re as surprised as anyone to see this update arrive first on a Verizon phone before any other carrier, but you won’t find us complaining. To download the update head into Settings>More>About phone>Software update. Cheers djgrundel, Patrick, and Scott!